RnD Motorsport Racing Rear Beam Bearings. Maintenance Free, PTFE lined, High Precision Spherical Bearings. High precision CNC manufactured Housings. Anodized Aluminium for corrosion resistance and lightweight. RnD Motorsport proudly present our Racing Rear Beam Bearing kits suited to the MK4 Astra G, including Coupes and GSi's. Our Spherical bearing kits are designed to replace rubber bushes with free moving, perfect position retaining, ultra high strength Spherical Bearings. Far superior to poly bushes, these remove all bind/friction and retain their position perfectly, meaning that they maintain the suspension geometry perfectly. The Astra's standard rear beam is mounted via two large rubber bushes at it's leading edge. These bushes are designed as a compromise between; being quiet and comfortable, and resisting lateral accelleration, or cornering force. This means that they flex and allow the suspension to deflect from its static position. What this deflection means for the rear wheels is that they end up steering the rear end of the car around the bend, much like the old Peugeot rear beams did. Whilst this sounds good, and isn't too bad to drive at more normal speeds and levels of grip, when you really begin pushing the chassis you quickly realise how "nervous" it is made by this design. This is because this lateral deflection is not really very well controlled. The amount of deflection is varying dependant upon the current level of force being applied by the tyres, and the whole process is completely undamped, which gives a very unpredictable, nervous, delayed and somewhat disconnected feel to the car. Vauxhall also had to toe the rear wheels in quite considerably to tame the rear end somewhat, further numbing the feel of the rear end. The solid nature of the bearings also results in a large increase in feedback from the tyres through the chassis, allowing you to feel the rear end communicating with you. As they are merely a pivot point of the suspension, most vibration is not passed through them when driving normally. It is only when lateral G's are being built that they transmit energy to the chassis, meaning that they don't add as much noise to the cabin as you might first imagine. These are the outcome of over 2 years of extensive testing from us on multiple cars. The most memorable comment described how it was now easy to hold a four wheel slide around the long sweeping right hander at the end of the pit straight of Oulton Park! 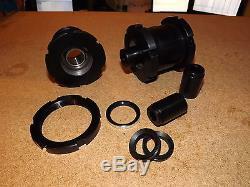 This kit up for sale will include two complete bush units to replace the rubber inserts on your rear beam. Approximate fitting time would be two hours- the old bushes will press/chisel out very easily. Designed for Professional installation and Racing use. The item "RnD Motorsport Racing Rear Beam Bearings for MK4 Vauxhall Astra" is in sale since Tuesday, November 11, 2014. This item is in the category "Vehicle Parts & Accessories\Car Tuning & Styling\Performance Suspension\Other Performance Suspension". The seller is "rndmotorsport231" and is located in York. This item can be shipped worldwide.